PSUs to Lead the Capex Revival Effort? PSUs have been in the limelight off late. With their massive cash piles, it seems the government is keen on them becoming good capital allocators. Either they put it to use or they pay it out. For the latter, there have been a slew of developments in recent times, which include the possibility of buybacks, or large dividend payouts. This development is also likely to lead PSUs to increase their investment plans. As per Mint, the top ten state run PSUs are likely to invest Rs 1.35 trillion as capital expenditure in FY17; this amount is higher by 11% YoY. The average annual investment for this lot stood at Rs 1.19 trillion in the preceding three years. 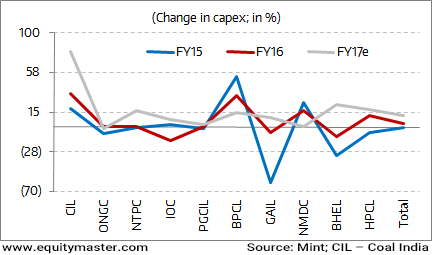 Today's chart of day shows the trend in capex of the major PSUs in recent times. Equitymaster requests your view! Post a comment on "PSUs to Lead the Capex Revival Effort?". Click here!